One of the more interesting natural features of Sydney Harbour is a reef that is located in the middle of the harbour just near the entrance from the open ocean. This reef has been given the name Sow and Pigs Reef. The reef is located just south of the Heads (the entrance to the Harbour) and about half way between the eastern and western shores. 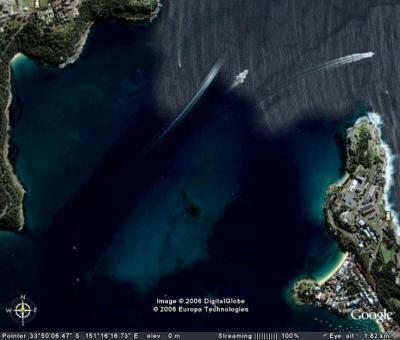 It is in an almost straight line between Camp Cove inside South Head and Oblisk Beach on Middle Head. 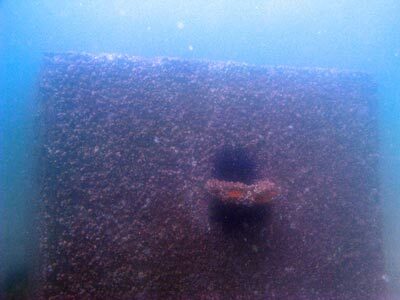 Originally the reef was quite exposed and presumably resembled a Sow (female pig) and her litter. I am unsure when or why, but at some time the reef has been subject to explosives by the Government in an unsuccessful attempt to presumably remove it. All this has done is make it a bit more dangerous as it is now covered in all but the lowest tides. The reef is relatively small, just over 150 metres liong and 70 metres at the widest. the longest axis is north-west to south-east. The western side is an almost straight section of reef from near the southern end to the north-western tip. This is the deepest side. To find this reef, travel in your boat to just off the inside of South Head and you will see four cardinal marks (North, South, East and West). 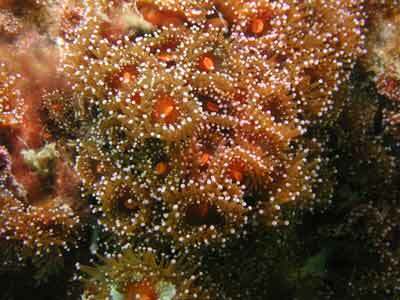 These are located on the outside of the extremities of the reef. It is safe to enter inside these but you will need to be careful. The lopcation is a very popular fishing site and at times you may not be able to dive it due to the numbers of boats anchored on the very small reef. It is probably better dived on an incoming tide and as close as you can to high tide. The current is not a problem. Once you arrive on the site, select which is the most appropriate side to anchor on considering the winds and the fishers. If at all possible, I would suggest anchoring on the southern or western sides. The maximum depth here is almost 8 metres compared to 4 metres on the northern or north-eastern side. 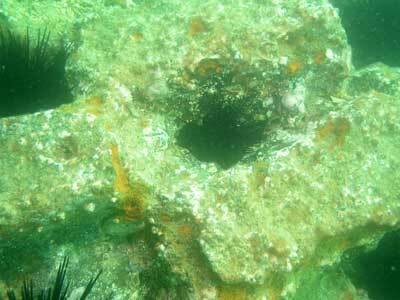 One of the many cracks at Sow and Pigs Reef Is this metal object a prop? Once on the bottom, head in one direction. The edge of the reef is quite obvious and creates a good wall in most places. As you go you will see that there are plenty of overhangs and cracks. Some are large enough to enter and there are even a couple of tight swim-throughs. 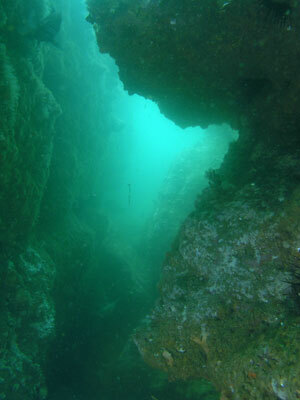 As you go towards the eastern side the depth comes up to about four to five metres. On the western side there is a huge concrete mooring block. I presume that this is an old mooring for a channel marker associated with the reef. On the southern and western sides there is a lot of metal. It is very old and some appears to be ballast. When I examined the photographs I took, one bit looks like the remains of a prop, although at the time I took it this was not something I thought of. At least six ships are recorded as having sunk after hitting the Sow and Pigs Reef. Perhaps these bits are part of one or more. The northern and eastern sides of the reef are not as prominent as the other sides. However, it is well worth going right around the reef. It will take about 30 minutes at the very least to circumnavigate the reef and 45 to 60 minutes would give a better dive. Fishlife all over the reef is not too bad. There are lots of bream, luderick and similar fish. I saw quite a few blue gropers and a few whiting on the sand. However, the fishlife was not as good as you would imagine considering the number of fishers that are sometimes anchored here. Visibility here is normally not the greatest, say five to seven metres. However, on a high tide when blue water is off the Heads, you could get as much as 25 metres. Worth doing if the seas outside are too rough.